Dollar Double Deals at Albertsons-2 Days Left! I made sure to hit both Albertsons on the way home from church today so I wouldn’t miss out on this great deal, it was so nice to have my husband in town today, he stayed in the car with the boys while I ran in. -$3 in Albertsons doubles ( I was only going to use 2 as the popcorn was already free, but the cashier wanted to give me the other double use! )Total OOP: $1! 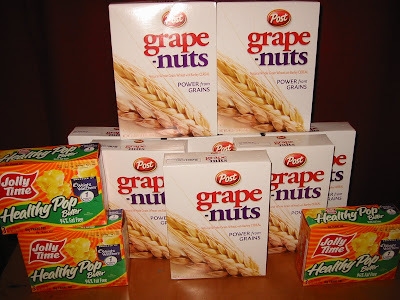 Get 4 boxes of cereal for $2 total! $3.77 for 12 double rolls! $4.99 plus a free box of cereal! If you are going to buy coffee anyway, buy two (also includes Yuban & Maxwell), get 2 free MulitGrain Cheerios, THEN get free bananas from buying the 2 Cheerios! You can also use a $1/2 coupon for the Cheerios and double that as well! Thanks Dsperin! What else did you find?! and thanks for commenting, I'm sure that will be of help to others! I have heard that Albertsons has a price guarantee, where if they overcharge you, you get the item free. Is this true??? If so, is it in writing somewhere. I went to Albertsons yesterday, and of course in such a hurry I didn't notice that the morningstars I bought rang up for $4.79 & $3.99!!! Not the $3 like I was expecting, but I'm not sure if I grabbed not participating items, (on all 3 items?) or if their computers messed up. Uggggg! Help if you know their policy. The coffee and banana deal are in the ad, but they are tiny. Look carefully. The manager that had to come assist the cashier didn't even know where they were! My Hormel coupon was only $.75 also, I'm in Damascus. I'm in Beaverton and my Hormel was only $.75. Guess it's a YMMV on that one. how did you find out about the coffee cereal and bananas deal? Is it automatic or do I need a coupon and where would I find a coupon?